Some guys like using their shaver with water or shaving cream (foam or gel), although Wahl® shavers also deliver a close shave to a dry face. Most Wahl® shavers are versatile wet/dry shavers. Shavers with circular/rotary heads can be difficult to achieve straight cutting lines and may result in an uneven shave. Wahl® shavers have long cutter bars, which help provide a straight shave and a more efficient shave. It also produces a quicker shave. Some shavers require regular charging, meaning they can die in the middle of a shave. 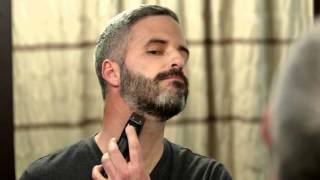 Go for a powerful lithium ion shaver that can last months without a recharge, even with regular use. When a quick shave is needed, keep in mind that many Wahl® shavers can be used after only a 1-minute quick charge. Get an ergonomic design, that fits snuggly in your hand. Wahl’s LifeProof shaver is even safe to drop because of its shock-resistant housing.